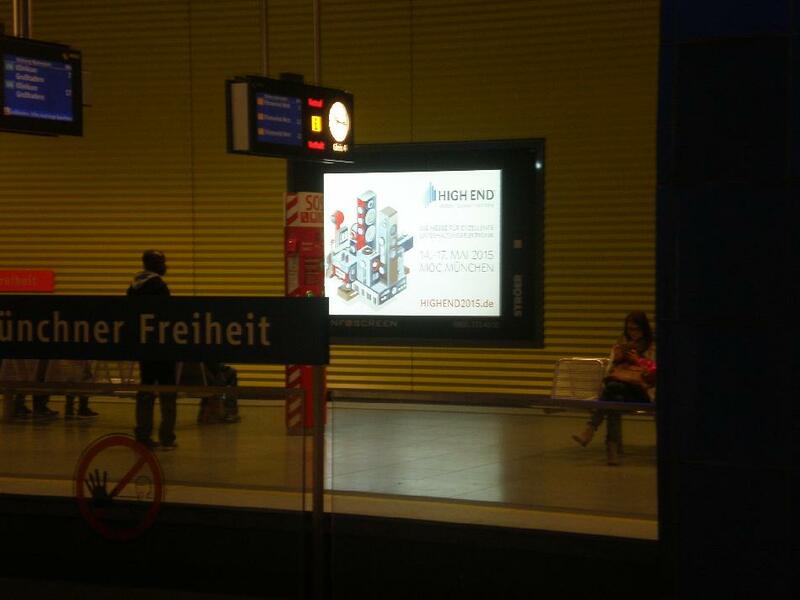 The Munich High End show 2015 kept all the main characteristics that so pleased me last year. I know that self-quotation is not elegant, but I think it's really useful to point you to the babble I scribbled down after the 2014 show, so I can avoid their pointless repetition here; I'd rather concentrate on further and specific aspects of the 2015 show. The 2015 Show got bigger, even adding the last huge hall available at floor level. The High End Society gave us the final numbers, showing an increase referred to last year: +4% in exhibition space, +12% in exhibitors, +13% in audience. In my opinion, the quantitative increasing didn't subtract anything from the quality: no exhibitor seemed unprofessional, all were usually warm in greeting visitors and all were often busy not only in demoing their stuff, but also in dealing with distributors and resellers. The audience, too, mantained its variety: international, of all ages, and composed not only of middle-aged men...Of course, the show was well advertised in the newspapers and on the streets: here is my lousy attempt at shooting the luminous ad in the subway station (of the line heading to the M.O.C.). First of all, the presentations: I followed the very interesting technical talks by Rob(ert) Stewart, the genial head of Meridian, and by Andreas Koch, the equally genial technical mind behind Playback Design, and technical advisor of many other companies working in the field of digital audio and DSD. 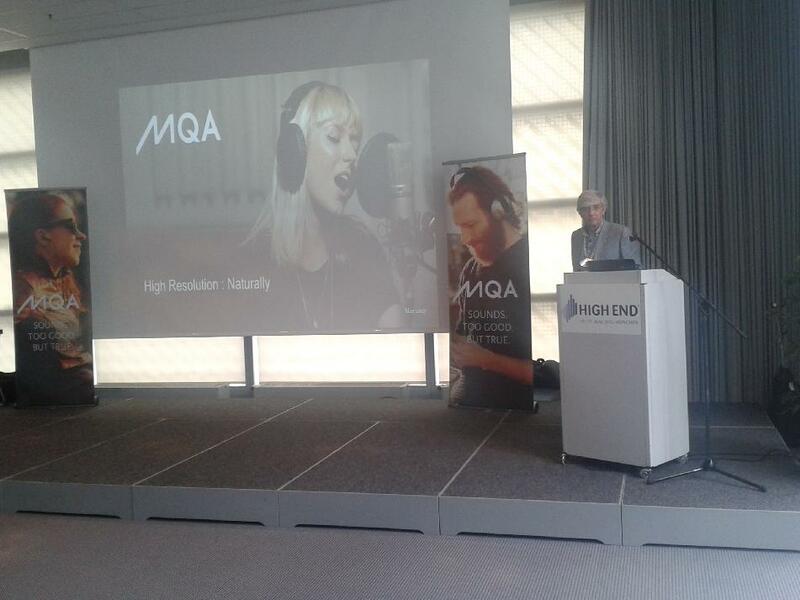 In his press conference, Stewart introduced his company's new project, called MQA, Master Quality Authentication. His presentation was very clear: I much appreciated the iterative style used by Stewart to pass complex technical ideas to a specialized, but not technical audience. In their own room, Meridian also gave further practical demos of the MQA system, in which Stewart himself partecipated, always available to kindly answer the audience's questions. Koch, too, was precise and clear, with an engeneering perspective, but also technically more difficult, and shed light on DSD's (lots of) pros and (few) cons. My education is non-technical, so I'm passing you what I understood, which doesn't necessarily support a coincidence with what Stewart and Koch said. First of all, MQA take care of music's QUALITY. Thanks to a multidisciplinary approach, integrating audio engineering with neurosciences and psychoacoustics, Stewart thinks that our perceptive abylity is extremely sensitive to very short, impulsive sounds, that we immediately perceive, being also able to quickly localize their source. From here, he followed the reverse logic passage: much of the information relevant for sound localization and recognizability depends on the informations that carry its temporal characteristics. Now, while we stay in the analog domain, those temporal relations are preserved and we don't face problems. They arise, however, with the conversion of analog sounds into digital, a process that implies the discretization of an (analog) continuous sound, by sampling and quantizing, an operation that, when performed with the ubiquitous technique of PCM, to obey to its own mathematical laws, need that BEFORE the A/D converter a filter is placed to get rid of all those part of sound (frequencies) excessive respect to the limit the conversion must respect in order to work without introducing errors; moreover, a similar filter is required AFTER the D/A converter; besides, the discretization of signal's amplitude into several bits always produces, with the real ADCs and DACs available, a quantization error. According to what I understood - and much of my understanding ows a lot to a clear article by F. Montanucci in the Italian Audio Review magazine, I could provvidentially read in the April issue - the problem is that those filters and the quantization error affect actually the temporal accuracy of signals, creating pre- and post-echoes, and, as little as this temporal error might be, it seems that we can perceive it, mainly when we deal with signals of the shortest duration, that appear to start before and end after the istant in which they should, instead, last. That, according to Stewart, should explain why the (analog converted into) digital sound has often been associated with an unpleasant sensation. Now, enter what Koch said. He showed us how, substantially, the whole process of A/D and D/A, if sported with the DSD technique, implies a quantization with only one bit (thus, the quantization error already starts with less probabilities to happen than with PCM) and, above all, the adoption of a sampling rate much bigger than the ones used in PCM. This allows the filters to be configured with a much shallow action than the ones required for PCM, and so they introduce much lower temporal errors. 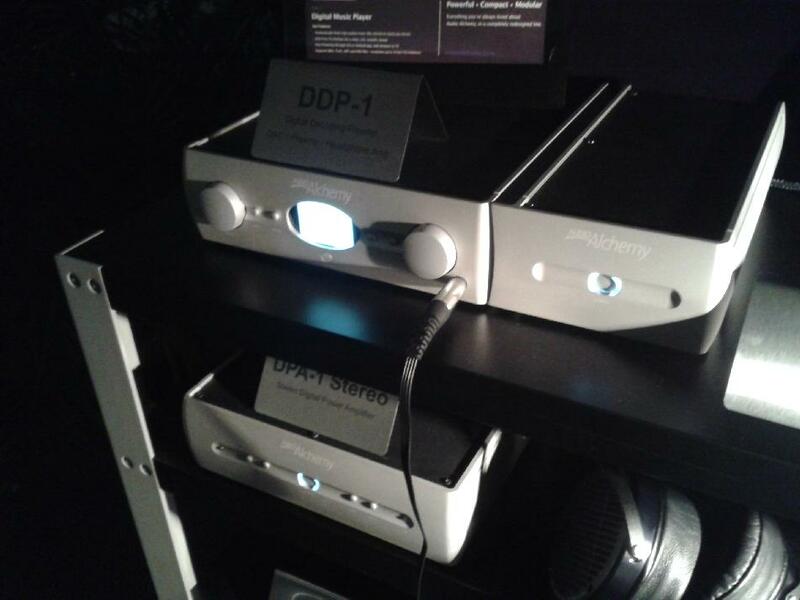 According to Koch, this is the main reason for wich audiophiles often subjectively prefer DSD over PCM. I remember that this is the base of the same explanation gave last year by PS Audio when introducing its top line converter, on which I reported on my H.E. 2014 essay. Another important point Stewart stressed is that those temporal microinformation can be found also in sounds whose frequency is much higher than the usual 20/21 kHz traditionally indicated as the threshold of human hearing of sounds, and upon which the CD standard was modeled (in the A/D-D/A process, the maximum frequency theorically reconstructable without errors is half the sampling frequency. Thus, from the choosen upper limit of frequencies in the safety zone of 22.050 Hz, derived the sampling frequency of 44.100 Hz). So, the band to assign to the A/D-D/A chain must be very wide, and this cause the need for a much high sampling frequency, exposing the PCM chain to the highest possibility to introduce time smearing. And Koch thinks that this is a condition in wihich DSD has a real advantage, since it is a system perfectly able to work with very high sampling frequencies. At this point, yet, Stewart and Koch split their paths. Meridian is convinced that it's not worth to rely on DSD, mainly because all the recording facitilites work in PCM (and format conversion is unanimously considered dangerous), and because DSD is a proprietary format, with relevant consequences in terms of technology and software licensing. That's why with MQA Stewart suggests his personal view of PCM sporting a particular implementation of the unavoidable filters, that he calls apodizing, that provide negligible levels of pre- and post- echo. This system can be used to digitalize in MQA mode the old analog masters. But, above all, it works also with non MQA-native digital files, like the huge library of record companies' master archives; in fact, knowing which filter was used for the A/D conversion, or even performing a specific analysys of the recorded signal (wich Stewart, with a very British attitude, said could be sometimes very, very complicated), is possible to know (or to close-guess) the errors produced by the filters initially used, and correct them, and then proceed with the D/A conversion with the better Meridian's apodizing filters, being sure to end with the best file-processing possible. This way, we rest in a PCM environment and are not forced to surrender to DSD, and yet the optimal performance is guaranteed. Here the Authentication idea chimes in: according to Stewart, this system can assure that the A/D (and D/A) process is as much neutral as possible, thus presents to the recording the mike feed in the less altered way possible, obtaining the best transposition on tape of what the Artist (and the sound engineer) intended to produce. So, once all the parameters for this process (included, eventually, the ones to correct the errors introduced by previous A/D conversions) are set, the final product is passed to the Artist who, if he/she likes it, approves it. When this MQA approved digital file is played back by a device (DAC, virtual player, etc.) able to cope with the informations of MQA system, the circle is closed, and in that moment the device reproduces that file exactly how the system thinks it must be reproduced, and only in this case the device understands that it's reproducing a MQA approved data flow and authenticates it. Actually, the MQA DAC alerts the user that the analog reconstructed sound is authentic to the original captured by the microphone and approved by the Artist because it respects the recording-digitalization-reproduction chain fixed aprioristically. Answering a specific question, Stewart rushed to clarify that this is no way a DRM system based upon public (inside the listeners' DACs) and private (inside the ADCs in the studios) keys, and that a MQA-coded file can also be played back by non-MQA devices, but, in this last case, no one will guarantee the coherence with the original. On the practical side, I have to say that during the listening demoes of (just experimental) MQA-coded files none of us doubted that they sounded more real and full, be they digitalization of old analog tapes, or new digital masters corrected and processed, or, finally, native MQA recordings. The problem is that it's a system that can't succeed if not adopted by recording companies, but they are showing themselves unwilling to let circulate files that are perfect certified copies of their recordings. MQA has also a big advantage, in terms of the generated FILE SIZE. Back to Koch: in his lecture he showed that the DSD coding generates a file that, albeit high resolution, sports dimensions slightly bigger than the one required by a linear PCM-coded file of resolution slightly higher than CD, and largely smaller than those of a PCM file at a similar high resolution. This, according to Koch, makes DSD the natural candidate as file format for streaming - that is, for what is unanimously indicated as the future way in wich music will be delivered - because it needs little bandwidth, thus making high resolution files streamabilty easier, more desirable for producers and providers. Yet, MQA sports also an elegant mathematical procedure that fully maximizes the density of the informations carried by the generated file, thus granting the ability to digitalize a very wide range of sounds whilst occupying the space of a traditional CD-resolution file, with reduced bandwidht occupation. This is another DSD advantage neutralized. Obviously, this solution - for re-incapsulating all the information that a high resolution file carries more than a CD resolution file - is totally back-compatible: a MQA file will safely be read by a non-MQA device, but it will read it as a standard CD-resolution file. This feature was clearly studied to promote recording companies' adehesion to the standard. Actually, you can produce MQA records that could be bought also by regular CD player owners, that is, the vast majority of people. Moreover, recoding companies avoid the hassle of making different masters for different media (one for CDs, another for DVDs, another for blu-ray discs, one more for MP3s, and so on), because they need only to produce a single MQA master and then the player takes charge of choosing what version to play, according to its abilities: of course, only the MQA-certified player would reproduce the file up to its maximum resolution, but the normal CD player would read the file, too, but it would reproduce a CD-level sound. In the end, I can't come to a defintive conclusion: as a matter of fact, I noticed that DSD is wanted by almost all DAC makers, be it a stand-alone device, be it embedded in multipurpose devices, and there are several websites offering DSD high resolution music files for download/streaming; even the Bavarian radio station BR played, at the show, demos about (digital) radio broadcasting of classical music, recorded in multichannel DSD and sporting excellent reproduction quality, thus making the audience aware of an institutional sponsorization of this system. On the other hand, MQA technolgy is just born and need support by recording companies to really profit from its qualitative pluses; it is always an elegant way of distributing high resoluton files without occupying much bandwith, making itself desirable by music operators aiming also to provide high resolution files for streaming/download, and that, not casually, are among the first supporters of MQA (among them, Tidal, Norwegian 2L, Onkyomusic, and others). Probably, we just have to let thing rest and see which way they will take: those are, actually, technological solution for a potentally huge market. In fact, several online music provider aiming to quality of the offered file were present at the High End 2015. There was TIDAL, which offers a streaming service of uncompressed standard CD resolution (44.1 kHz / 16 bit) music files and high resolution videos for a monthly rate of € 20, and a download service of music files up to high resolution (up to 192 kHz / 24 bit). Moreover, there was QOBUZ, that, besides the known services of download and streaming at increasing quality option, offers also an option (called Sublime) that allows, in addition to the normal streaming of all their catalogue in standard resolution, the ability to download the same catalogue in higher resolution (up to 192 kHz / 24 bit) at the same price of the compressed files, and the possiblity to listen to them via streaming (so, not in high resolution) on all your registered devices, for about € 220,00 a year. There was also David Chesky, with his HD TRACKS, nowadays a sure international referring point for the high resolution download market. Then, there was also a young start-up company: PRIMEPHONIC. It is a company that, if I didn't misunderstand, is a kind of spin-off of Pentatone, so with a very respectable pedigree, and it offers a download service for highest resolution DSD files; but, up to this, it's nothing special. The originality of the Primephonic guys resides, above all, in that they provide only classical music, for a price that, for most files, is around € 12 for each download. Moreover, their offer wants to go beyond the mere download service, making available also a refined editorial content - not only a virtual one, but also a material one, a paperback magazine (at least, I have the 2015 edition...) - relative to the single available file, of wich they provide data, also in graphic forms, that analize its quality under a technical point of view, to give a kind of an objective analysis of the content of the file you are buying, figuring out if it's really high resolution stuff, or something at lesser resolution and just dressed like higher resolution, something that should not be present in their catalogue. This seems to me a noticeable sign of distinction, of seriousness, of attention toward their clients. Moreover, they provide illustrative editorial content either for the single files, and for more general themes. Everything aims to stimulate the awareness of the value of classical music that, in their opinion, is at risk of reduced common knowledge, because it's scarcely present, if not completely absent, in the offer of other providers of streaming/download services. They gave me their magazine, which I think it's beautuful and well cared upon, and reflects the website style. Even only for the enthusiastic way in which they answered my questions, I think these guys deserve at least a chance: visit theit website and, since they are rookies, leave them a feedback, too; you'll help them to grow up. 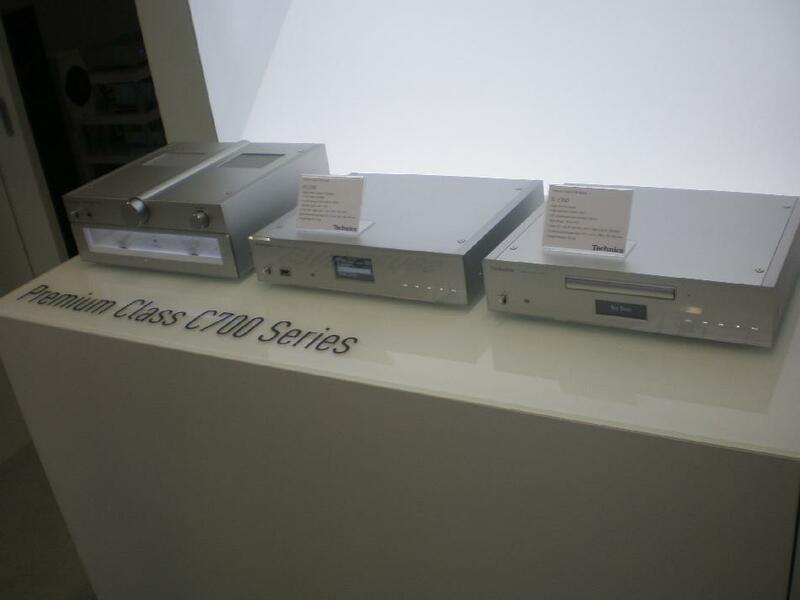 Lastly, I participated in the presentation of the last DAC by CHORD, designed by their own Rob Watts and called DAVE (Digital to Analog Veritas in Extremis). Available in october, at an announced price of UKP 8.000, Chord offers a pre/DAC that develops the very good results of their famed HUGO DAC, but sporting a FPGA wich is 10 times more powerful and aimed to improve two parameters. Regarding the first one, moving in the same direction of the MQA system described above, they improved the dac's performance in the time domain, drastically lowering the ringing of the interpolator filters and increasing the FIR's taps (taking them up to 164.000); also Watts insisted on our sensibility to the perception of even the smallest temporal variations and on the subsequent need to expand the frequencies in wich the FIR operates, thus rised up to 2.048 Fs. Regarding the second parameter, they improved the performance of the already superb Hugo's noise shaper, now rised upt to the seventeenth order, sporting 46 integrators: I can't tell you exactly what this means, but Watts commented this data saying that the code needed to program only the NS wouldnt' fit in Hugo's FPGA. Lastly Watts, being a good technician, stressed the importance of measurements to give an objective reference to the improvements they subjectively perceived. In particular, he underlined the values of the noise: THD + noise at 1 kHz, measured at 5 V lays at -124 dbA, measured at 2,5 V lays at -127 dbA and even lowering the level of 60 db, it still measures - 127 dbA; this means it is not only a very silent device, but also a very linear one, that introduces very low level of distortion. This year, too, among the many (many) booths and suites I visited, there were some that struck me more than others. Generally speaking, I can confirm that I rarely heard unpleasant or uncorrect sounds; yet, more than last year, I happened to listen to demos playing music that was, at least, arguable. 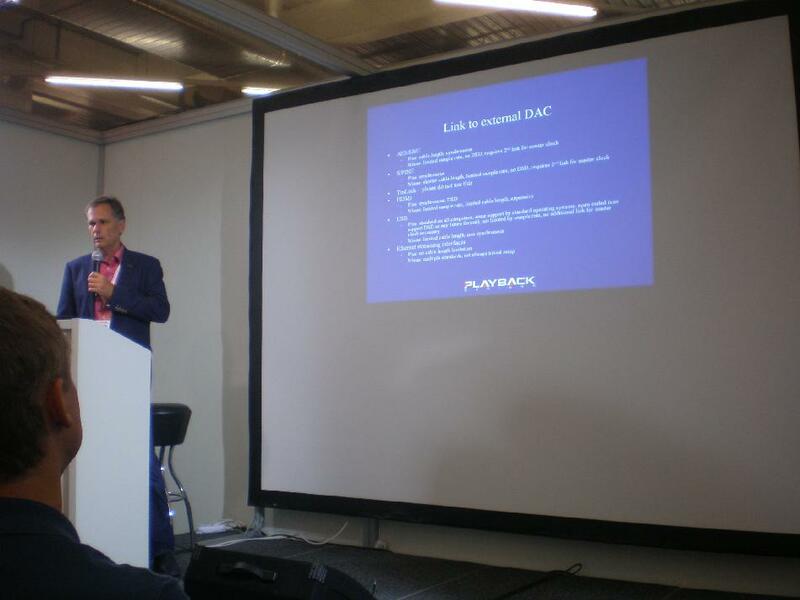 Also this year the vast majority of exhibitors used as source a data bank made of files resident in some hard disks connected to the DAC part of their system and wirelessly commanded via an i-Pad or the like. Buth this, instead of provoking an extremely varied musical proposal, unexpectedly led to an almost standardisation: electronic music, especially underlining punch, speed and spaciousness; some easy jazz, a bit of audiophile-approved rock, a plethora of string-voice or piano solo and some rare symphonic pieces. With such an unlimited access, maybe I would have stuffed my hard disk with sometìhing more than Diana Krall, Ella & Louie, Pink Floyd, Private investigations and Money for nothing, Daft Punk (at least, I would have used also the new tubes with Nile Rodgers...), the well tempered klavier, the Tumblers' dance and The great gate of Kiev. Anyway, let's state it clear: many of those tracks sounded very well and were always a pleasant listening; moreover, every time I made a particular request, the person responsible for the demo (not rarely, the owner/designer...) always surfed his archive to meet my (mild) desires. Let's proceed to some of the room I visited, listed without a particular order. A good large room. 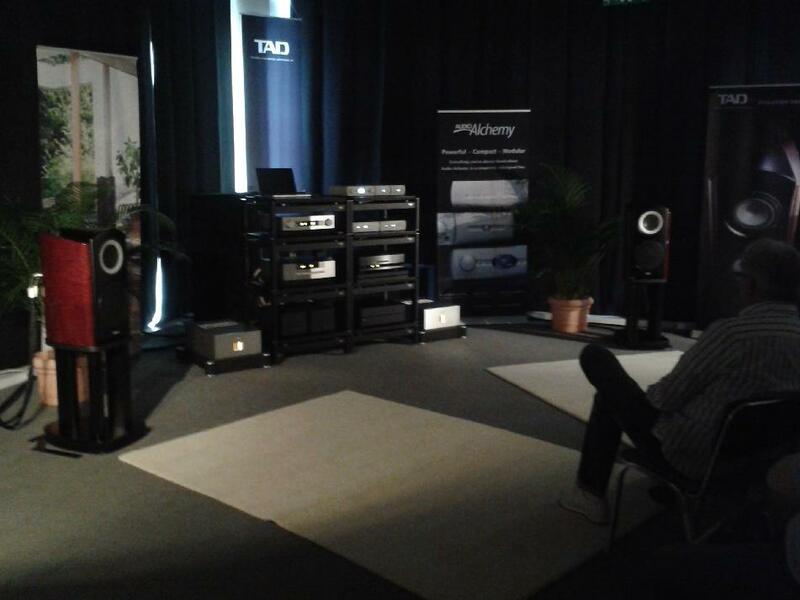 TAD demoed two systems, one made of Reference series components, sporting the usual exciting sound, full, correct, pleasant, etc., and asking a very high price, as we can expect, of course, by the top range system. 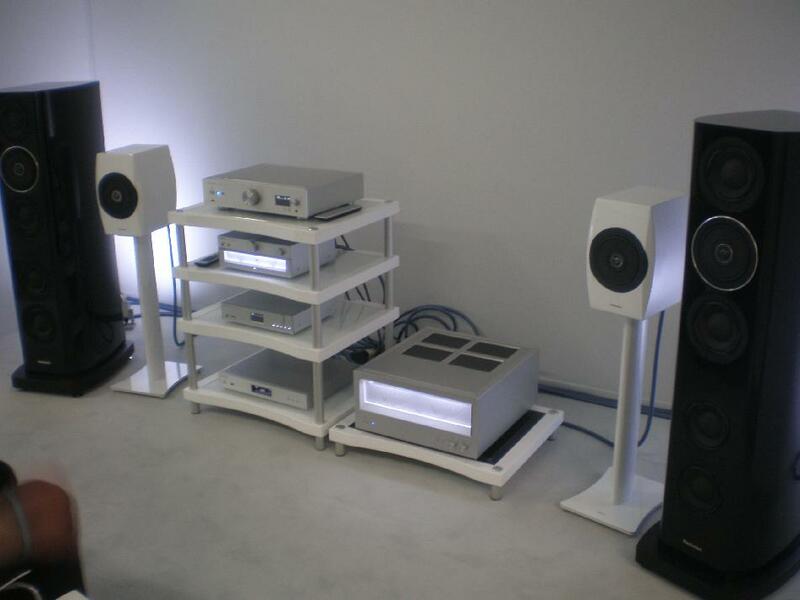 The other system was made of Evolution series components: DA 1000 MkII SACD player/DAC/volume regulator (€ 18.000), M 2500 stereo power amplifier (€ 25.000), and the new Compact Evolution One bookshelf loudspeaker (€ 20.000 + € 2.000 for matching stands), that last year were silently exposed just as a prototype and now are finally available; it's possible to customize (of course, with an adequate overpricing), the aesthetics, by factory mounting side walls made to order or choosen among few artistic lacquer models expressly made for TAD. Another great comeback, this time of the Technics brand. It's led by a gracious lady who is either the chief Engineer and a renowed classical piano player: a strong symbol - from a traditonally symbolistic culture - of the new importance given by the Matsushita group to Music, consequently revitalizing its brand specifically aimed to it. Actually, the demo I assisted to made us listen to brief excerpts form music pieces reproduced via the two systems now available: one from the basic series called, maybe a bit naively, Premium, and the other from the top series named, you guess, Reference. 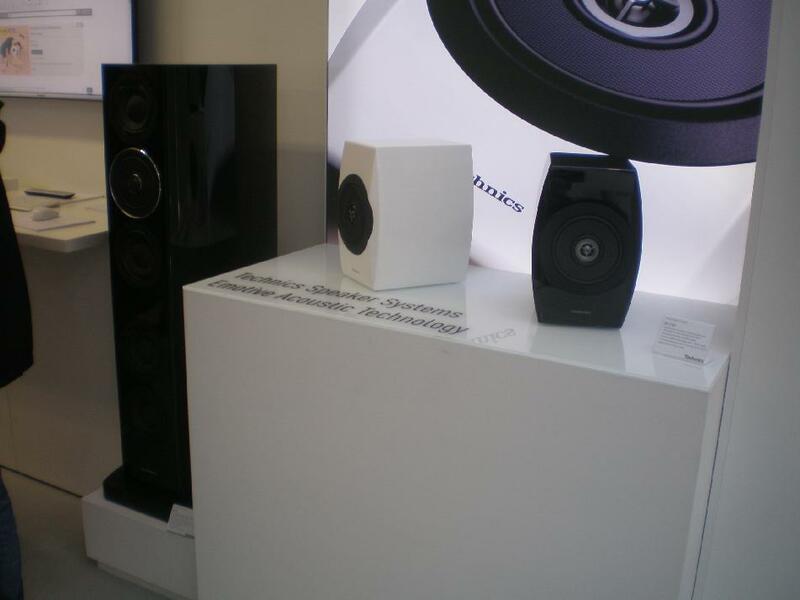 The Premium series is made of a CD player (SL-C700, € 1.900), a network player (ST-C700, € 1.900), a 45 W/ch integrated stereo amplifier (SU-C700, € 1.300) and bookshelf loudspeakers (SB-C700, € 3.500/pair). In both series, the loudspeakers sport a special concentric driver that in the SB-C700 covers the entire range of frequencies, while in the SB-R1 is supported by other traditional drivers for the lower frequencies. This gear's aesthetics was undisputedly appreciated by all the seniors like me that were present; their features are completely up-to-date for modern times, sporting functions of streaming, of DACs and so on; acoustic rendering was pleasant, but, in my opinion, not even appreciable in that constricted space. For this reason, I asked to one of their personnel if the company was thinking to showrooms more adquate to show the real quality of of their gear's sound. As an answer, we surfed the Technics website, naturally opened at the german pages, where is the list of the resellers where to buy (hopefully, by previous listening) their components; a further inquiry on the Italian pages showed an identical content, except for the dove acquistare (where to buy) menu option, the only non-active… I was told that interested customers in Italy should contact directly Panasonic Italia, at least for now. I must also mention that Technics is now among the online music providers, offering an uncompressed music file of at least CD-resolution download service: Technics Tracks, where, for now, sales are allowed only toward UK and Germany. Here, I'm going to tell you about a device I saw used in a lot of other rooms. Last year I wrote about the trend for wich many IT companies showed their products conceived also for our world, but, in the end, betraying their own nature, with an unavoidable rise either of the - usually popular - prices of informatic devices, and of their design complexity. This year, one of those companies decided for a better presentation: MELCO showed two network players with internal storage, both very well built and with a singular circuit for cleaning the signal entering the device from an ethernet port. One model - N1A, for about € 2.000 - is based on a traditional architecture, sporting two 2 TB internal Hard Disks; the other - N1Z, for about € 8.000 - sports a refined power supply, a nicer motherboard and two 512 GB internal SSD Hard Disks (they told me that just those two SSD units have a production cost that equals that of a whole N1A model). As I said, those were models actually used by lots of other exhibitors, and this is already a good reference. The main characteristics lays, in my opinion, in the history of this company: the memory devices used are made by the famed IT producer Buffalo, whose technological and financial ability was directed toward these audiophile pervertions. That was possible because Buffalo's owner is also Melco's revered old owner, Mr. Makoto Maki, who depicts himself as a longtime audiophile - always under the Melco brand, he produced also a monumental turntable - and so he understood that the use of the big and specialized resources of its IT division would have produced very good results in the audiophile world. Bryston put up a really nice room. First of all, for their accueil: the first half of the room was occupied by the exposition of papers, pamphlets and brochures, the exibitions of their headphones amplifiers, and, above all, a real bar counter, with two of their people very busy in operating a real espresso machine with coffe bean real-time grinder, offering (really) good espressos and cappuccinos... Very pleasant and surely of big effect on visitors. The other half of the room was a well insulated space totally dedicated to the audition of their system entirely made of Bryston gear. The source was, as always liquid, a network player (model BDP-2, for about € 3.600) remotedly commanded via a tablet, whose digital signal was converted by their DAC (model BDA-2, for about € 2.800), whose analog output signal entered into a preamplifier with separated power supply, driving two monophonic power amplifiers (model 7B, for about € 5.600 each) that, in their turn, drove two big bookshelf loudspeakers (model Mini T, for about € 3.300). 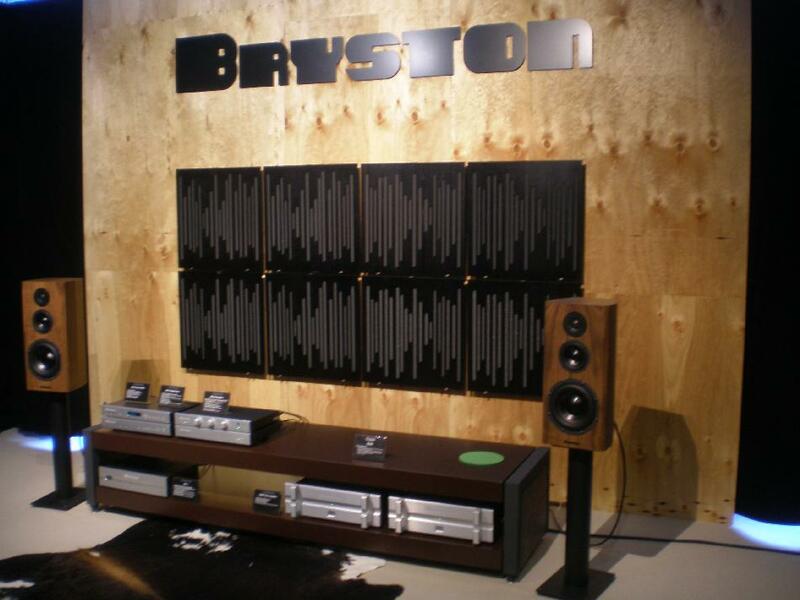 Actually, Bryston brought at the show also their bigger loudspeaker model, the floorstanding Model T, but they told me that, after an initial setup, either they and the audience preferred the (so to say) little ones, that were so left in place. 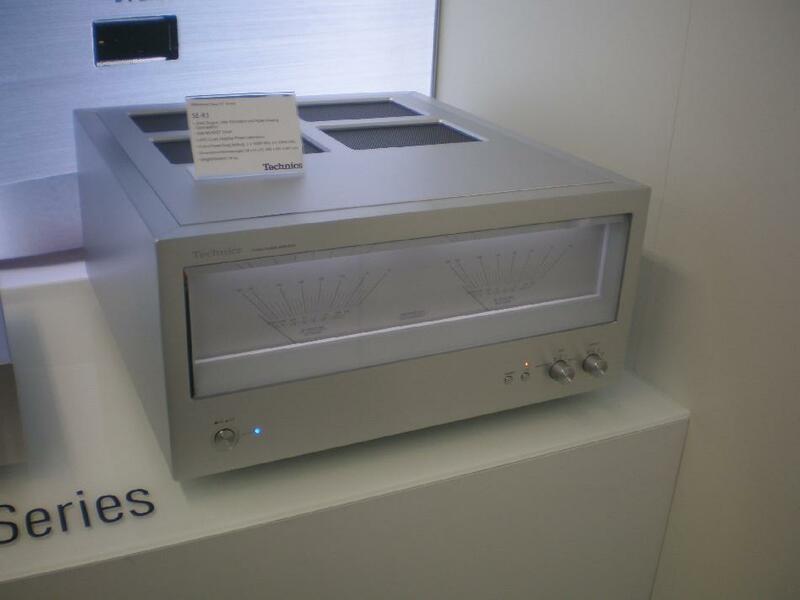 Bryston is known for its electronics, but now is achieving good results also with loudspeakers, whose design, thanks to close collaboration with Axiom, includes autonomous driver realization and measurements made in a real anechoic chamber (that is, not simulating an anechoic environment by temporal windowing a free-field acquired signal). Very good sound, well defined and never fatiguing, probably tanks also to the very cared upon room acoustics, with passive acoustic correctors precisely hung on the perimetric sides of the room, placed up against its walls. The very kind Bryston representative in charge of demoing the system assured me that he, in his own more typically domestic room, can achieve quite similar acoustic results using only the 4-B SST stereophonic power amplifier, sporting half the power of the exhibited monoblocks (and almost half the price, too: about € 5.400). Bryston produces also another player, model BDP-1USB (for about € 2.400): don't let its moniker fool you (like I was, seeming even dumber to the very patient Bryston personnel), because this is not a new version of the old BDP-1 model, now discontinued and completely substitued by the very complete BDP-2 model described earlier; it is a music file player aimed to people who already have a DAC with only one USB input (or that sports its better performance using that input...). The BDP-1USB accept on its USB input external HDs and flash drives, in addition to the signals arriving into its ethernet port, while its output connects to your DAC's USB input. 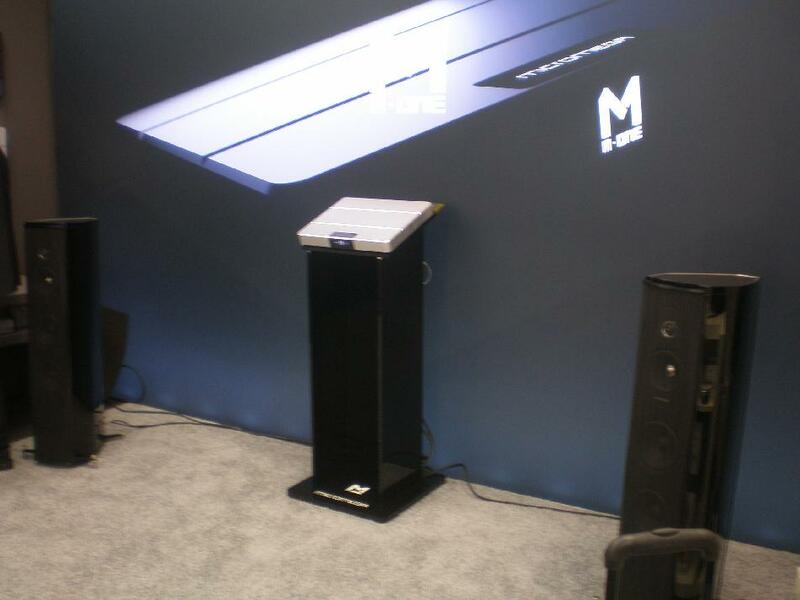 Inside the big exhibition spaces of the great Audio Reference distributor, this year a great relevance was given to MICROMEGA that, with big understatement, showed an interesting device: the M-1. In a single-piece aluminum chassis, rectangular, of reduced height, that can be placed upon a table (or an unusually deep bookshelf) or hung on a vertical (or oblique) wall, this French company was able to put, as a standard composition, an amplifier, a DAC capable of dealing with the highest resolution signals (PCM up to 768 kHz / 24 bits, DSD), a preamplifier with also unbalanced inputs and outputs, an MM/MC pre phono, an Airplay/Blutooth receiver and a network player; all this can be remotedly commanded by the ever-present app for smartphone or tablet. In addition, you can plug in optional modules to activate a DSP room correction, whose power is scalable for increasing needs (and costs). Finally, following a trend seen also elsewhere (think TAD, or - guess who? - Sonus Faber with its new Chamaleon loudspeakers), Micromega allows for a complete external cabinet aesthetic customization. The system showed, thus, was made of only this elegant big square box and a pair of loudspeakers (yes, Sonus Faber, you guessed right). I'm hearing you: "look, a French audio Company proposing an all-in-one device, flat and square, connected to everything, remote-commanded and very styilish...". Not really. The lookalikes with the big rectangular boxes from Devialet are only superficial, because under the hood they are two completely different things: Micoromega sports a solid non-switching AB class amplification section, the DSP for digital processing can work not only for the room correction, but also to reconstruct a binaural sound (that many think it's the best way for headphone listening), the pre-phono is on board... Summing up they are different devices aimed to different customers, and - not unpleasantly - they sport a very different price, that makes the M1 much more affordable. Micromega is launching two models, the 100 and the 150. The 100 model sports a... 100 w/ch stereo amplifier, will cost € 3.500 in its basic configuration and can accomodate several optional modules for the binaural coding and the different steps of room correction; while the 150 model sports a (you tell it) 150 w/ch stereo amplifier, will cost more than € 5.000, and is already equipped with the modules for the binaural coding and for the first step of room correction (the other steps are optional modules). I think it's an elegant solution, really interesting. A parade of phono cartridges exhibited in a big booth in one of the huge Halls at floor level immediately caught my interest for a stop-by. Their personnel was, as always, very informative and kind, answering every question. Their paper catalogue is among the few I brought back home; but it's a clear sign of nostalgic ageing ;-) Like every producer, also AUDIO-TECHNICA exhibited solutions for personal listening, evidently an increasingly felt exigence in living spaces even smaller and shared with others we don't want to disturb with our blatant sonic passions. Among the several models of headphones and DAC/can amps to drive them, my eyes were caught by a product evidently belonging to a superior league. Enter the AT-HA5050H, perfectly up and running: a bold hybrid (2 JJ E88CC tubes) amplifier, designed to drive more than one headphone, sporting two series of 4 outputs on 3,5 stereo jack for 4 different impedance values (from 0,1 to 120 Ohm), even combinable to adjust for the global sum of the two connected hedphones, sporting analog inputs, also unbalanced, and digital inputs either S/PDIF (PCM, up to 192 kHz / 24 bit), either USB (up to PCM 384 kHz / 32 bit, or DSD 64). '70s vintage aesthetics and big names for inner parts (Nichicon and Wima capacitors, Lundahl input transformers). Althoug their open space was somewhat noisy, I could enjoy for several minutes a very pleasant listening from an unknown streamed source (but they also had a little living room-like space with vinyl playing, for those who preferred; and it was always full of people...). It evidently is their top product for its genre and it will have a consequently high price tag, that should be around € 6.000. 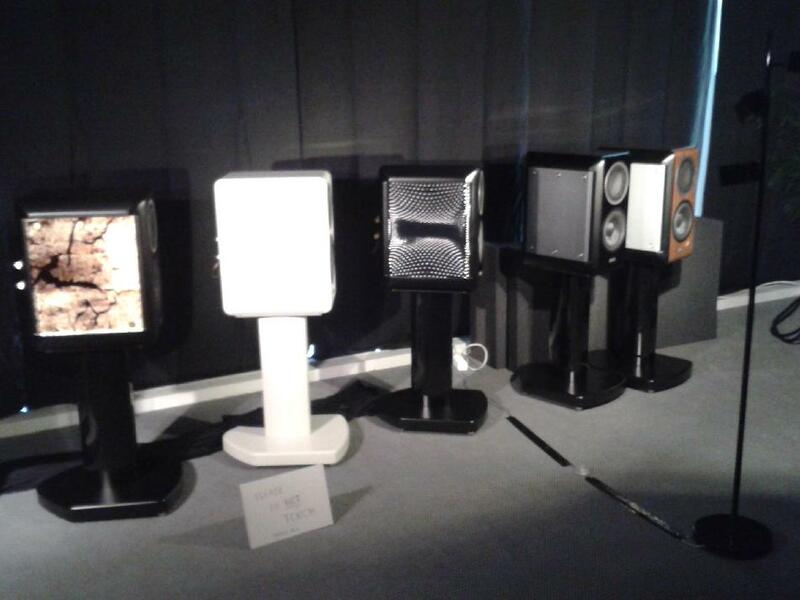 This year, too, PMC loudspeakers offered a sound I liked a lot. 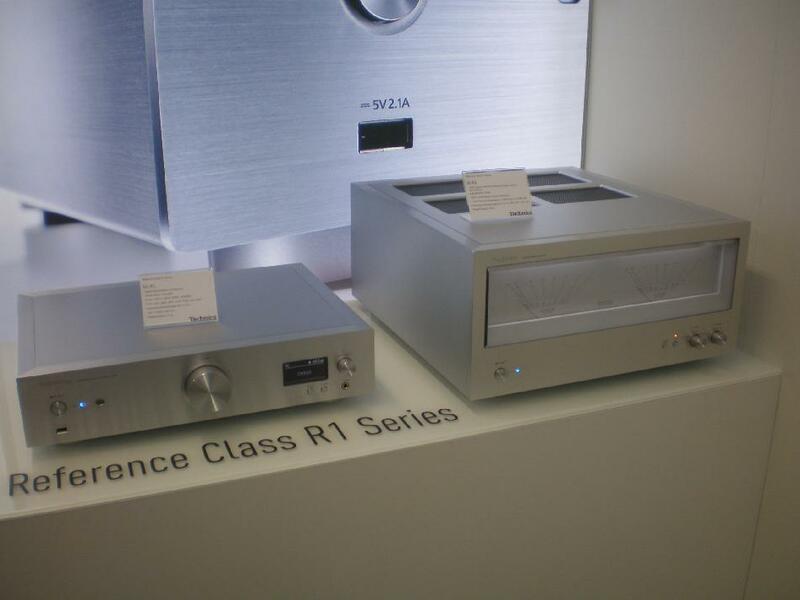 This was true for their better commercial room, open directly on the Atrium, where they exhibited some Fact series models driven by Bryston amplifiers (it used to be a classic match for both brands) and a Prism Audio professional DAC. The adoption of this DAC betrays PMC's origin in the pro market; actually, PMC gives voice to lots of recording studios, where also Prism Audio is well regarded. The room responsible told me they used Prism Audio DAC in their exhibition system either because it's what they use when voicing the speakers at the factory during production process, either because... both companies' laboratories are practically the next door each other.